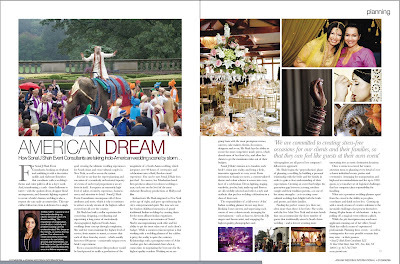 Asiana Wedding International Magazine - Sonal J. Shah Event Consultants, LLC. For the longest time, I have so admired Asiana Weddings International Magazine. I really wish we had something like this for the South Asian Brides in the US. I am so happy and honored that they decided to feature our company in this issue. The article is very well written and talks about the high level of service we provide to our brides. It is always so great yet humbling to read about our company in articles such as this. All of us really love what we do and love helping brides. Really from sun up to sun down we live, eat, breath weddings and it is great to be recognized for it. I want to thank the Editor and the wonderful staff at Asiana for featuring us! I also want to thank our staff who work so diligently on all of our weddings.